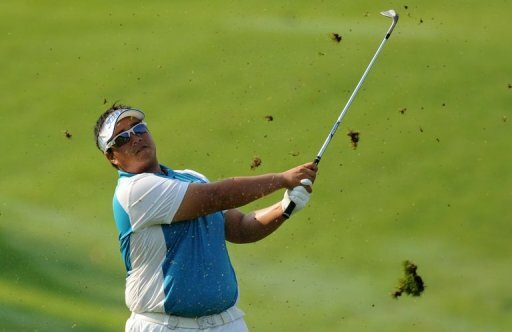 Kiradech Aphibarnrat plays a stroke at the Maybank Malaysian Open in Kuala Lumpur today. The Thai golfer staked out an early lead as world number three Luke Donald struggled to settle in on a rain-interrupted first day’s play. Thailand’s Kiradech Aphibarnrat staked out an early lead as world number three Luke Donald struggled to settle in Thursday on a rain-interrupted first day’s play at the Maybank Malaysian Open. Kiradech posted eight birdies for a seven-under 65 to go top as roughly half the field managed to finish play before thunderstorms moved in at the Kuala Lumpur Golf and Country Club. But European Tour stalwarts Edoardo Molinari of Italy, Denmark’s Anders Hansen and Frenchman Gregory Bourdy were just a stroke behind, while 36 others shot under par at the $2.75 million tournament. Kiradech, 23, who is suffering from a thyroid condition, had to hold back with his driver to preserve energy in a steamy morning session, but it did no harm to his game. “The weather is too hot, and the thyroid disease is making me feel tired. Honestly, I didn’t have enough energy to hit long drives,” he said afterwards. The young Thai is off to a strong start for the year, finishing third at the Asian Tour’s season-opening Zaykabar Myanmar Open and fourth in last week’s Avantha Masters in India. He also qualified recently for his maiden appearance at the British Open later this year. Despite chipping in for birdie on the last hole, Donald managed only a two-over 74 after three straight bogies early in his round. “The game was quite tough for me, as it’s one of those courses where if you’re a little bit off, it can get you,” said the Englishman, who is making his Malaysian Open debut. Those who were unable to finish their rounds before the storm clouds rumbled in are in for a long day in the humidity on Friday, when they will tee off early to make up the missed holes. Three-time Major winner Padraig Harrington of Ireland was tied with eight others after shooting a three-under 69. “Three under par is a reasonable return,” said Harrington, who admitted he was “suffering” in the Malaysian capital’s notorious humidity. “I’m pumping out sweat,” he said. The tournament is co-sanctioned by the European Tour and the Asian Tour.